Count Down Bash Pary 2011 With DJ Ashrafi is an event that took place on 31-Dec-2010 in Hyderabad. Welcome the New Year dancing and swaying to the beats of Bollywood, house and hip hop music with DJ Ashrafi on 31st December at the Bottles and Chimney. Hailing from Kolkata, DJ Ashrafi figures among Asia's leading female disc jockeys and is rated as the top female Bollywood DJ in India. She is popularly known as the "Queen of Bollywood Remixes". With no professional training, DJ Ashrafi started her career as a sound engineer in renowned Punjabi singer Sukhwinder Singh's studio in Mumbai. She is a sound engineer by day and a DJ by night. Known for her high energy performances, she has had the privilege of performing at clubs and gigs in India and all over the world such as Prive, F-Bar, Manre, Hard Rock Cafe, Olive bar & Kitchen, Provogue Lounge, Elevate, Tantra, Enigma, In the Mix, Bottles & Chimneys, Capitol Orange, Lush, and Dublin. 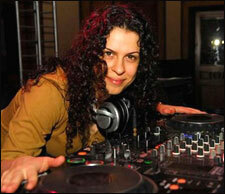 She plays a range of music from bollywood to hip-hop, club to house, retro and lounge. Entry tickets are priced at Rs. 3,500 a couple and includes unlimited drinks and snacks. Please contact 2776-6464 for further details. Be the first to comment on Count Down Bash Pary 2011 With DJ Ashrafi! Just use the simple form below. fullhyd.com has 700,000+ monthly visits. Tell Hyderabad what you feel about Count Down Bash Pary 2011 With DJ Ashrafi!